Gibson, S. & Kelland, J. (2009). Connecting Preservice Teachers With Children Using Blogs. 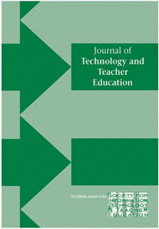 Journal of Technology and Teacher Education, 17 (3), 299-314. Waynesville, NC USA: Society for Information Technology & Teacher Education. Retrieved April 20, 2019 from https://www.learntechlib.org/primary/p/28230/. Archer, J. (2007). Leaders’ blogs offer candid views on life in schools. Education Week, 26(35), 10. Boon, P. (2006). Ontario blogs: Harnessing the educational potential of blogs. Output - Education Computing Organization of Ontario, 26(4), 19-20. Cowtan, S. (2006). The educational use of blogs. MSLA Journal, 33(2), 19-24. Dickey, M. (2004). The impact of web-logs (blogs) on student perceptions of isolation and alienation in a web-based distance-learning environment. Open Learning, 19(3), 279-291. Ferdig, R., & Trammell, K. (2004). Content delivery in the ‘blogosphere.’ T.H.E. Journal, 31(7), 12-16. Fryer, W. (2006). Successful and safe educational blogging. BIT: Educators of business and information technology, 33(1), 4-8. Jilks, J. (2006). Blogging—A way to get the message home! Output—Education Computing Organization of Ontario, 26(4), 12. Langer, A. (2002). Reflecting on practice: Using learning journals in higher and continuing education. Teacher in Higher Education, 7(3), 337-351. McPherson, K. (2006). School library blogging. Teacher Librarian, 33(5), 67. Poling, C. (2006). Blog on. Output—Education Computing Organization of Ontario, 26(4), 8. Stiler, G. M., & Philleo, T. (2003). Blogging and blogspots: An alternative format for encouraging reflective practice among preservice teachers. Education, 123(4), 789797.